Do Otorten and Kholat Syakhl realy mean "Don't Go There" and "Mountain of the Dead"? Why the livor mortis spots did not match the position of some bodies? Where did the knife that cut the branches go? "Now we know snowmen exist"
What happened to the original paper Evening Otorten? Where there burned trees in the area? Kholat Syakhl is called by Mansi "Mountain of the Dead" because legend goes nine Mansi hunters died mysteriously there. Others say they disappeared altogether. Mount Otorten is called "Don't Go There" because these mountains, especially the "gates" between them are considered sacred and dangerous since ancient times. According to a native Mansi linguist, Tatiana Slinkina, peak Otorten name is Woot-Taaratane-Syachl which means "The Windy Mountain". Other sources say this is the name of Peak 880. There is no written source or other proof that Mount Otorten is called "Don't Go There". The name means "Dead Mountain" because of it's bare slopes. This can explain how we get "Mountain of the Dead" or "Mountain of the Death". Tatiana Slinkina points another Mansi name for Peak 1079 Lunt-Choosup-Syachl, meaning "Mount Goose Nest" because of a legend that, after the global flood, one goose survived on the peak of this mountain. On January 31, the group arrived at the edge of a highland area and began to prepare for climbing. In a wooded valley they cached surplus food and equipment that would be used for the trip back. 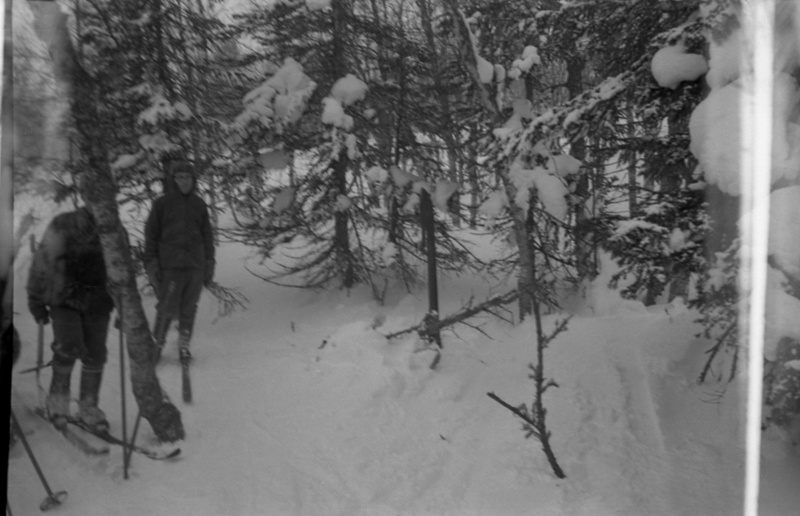 The following day (February 1), the hikers started to move through the pass. 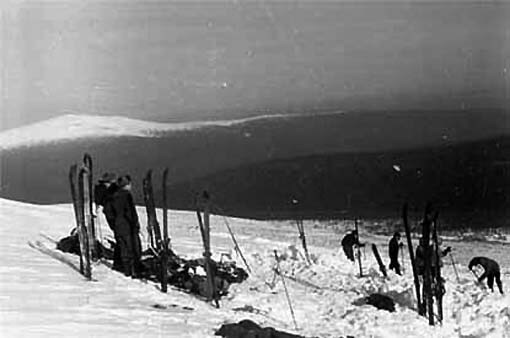 It seems they planned to get over the pass and make camp for the next night on the opposite side, but because of worsening weather conditions–snowstorms and decreasing visibility–they lost their direction and deviated west, up towards the top of Kholat Syakhl. When they realized their mistake, the group decided to stop and set up camp there on the slope of the mountain, rather than moving 1.5 km (0.93 mi) downhill to a forested area which would have offered some shelter from the elements. 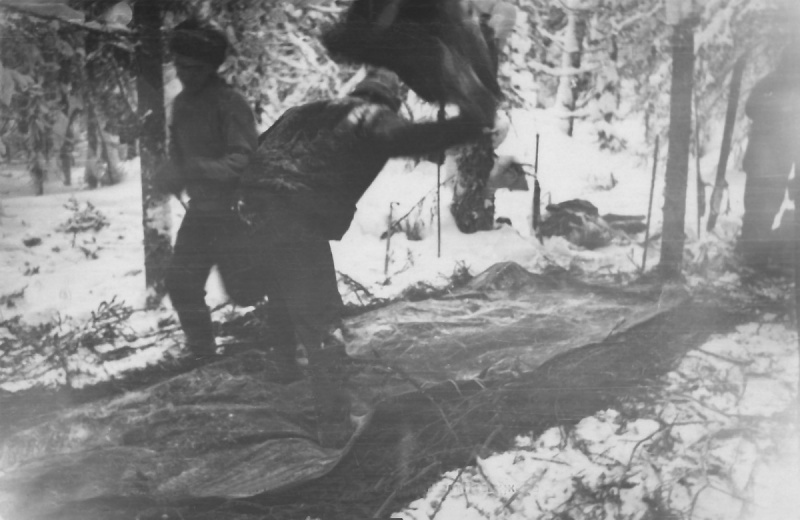 Yudin, the lone survivor, postulated that "Dyatlov probably did not want to lose the altitude they had gained, or he decided to practice camping on the mountain slope. " It is judged, based on the weather information available, what had been written in their journals and on information about the group's progress by Yuri Yudin, that they would have reached the slopes of Kholat Syakhl sometime in the afternoon of 1 Feb. At that latitude and time of year sunset is 1658, so it can be reasonably assumed that they got to the point were they pitched tent 60 minutes or so before then in order to give them time to erect the tent in daylight. Their final destination was Mount Otorten, and it was not feasible for them to have continued on at night. 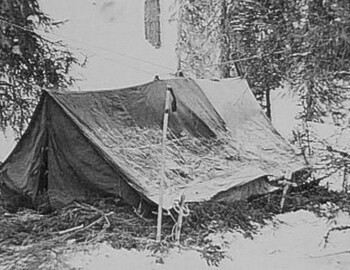 We can never know precisely why Dyatlov ordered the tent pitched were he did, but I doubt it was because they were lost. They were in fact on the correct route to Otorten. Also, if they managed to find their way about 1,500m to the treeline in the dark and in some difficulty after leaving the tent in a panic, they why could they not find their way to the treeline in daylight, and in good order? It must be presumed, without evidence to the contrary, that Dyatlov had intended to pitch the tent on the slopes of Kholat Syakhl. It is of course speculation that this was to give the group an extra challenge. Another factor is that when dawn broke, their destination, Mount Otorten, would be visible from their tent. This, after a difficult journey, would be good for moral as they could see their destination. This of course is speculation, but I do not believe they were lost and bumbling about. And to re-iterate, if they were lost, why could they make it to the treeline in the dark in a panic, and not in daylight in good order. "Tent site is located on the North- eastern slope of mountain 1079 (Kholat Syakhl official term) meters at the mouth of river Auspiya. Tent site is located 300 meters from the top of the mountain 1079 with a slope of 30 °..."
Rescuers removed hikers belongings, folded the tent and carried them down the slope for the convenience of the subsequent evacuation. 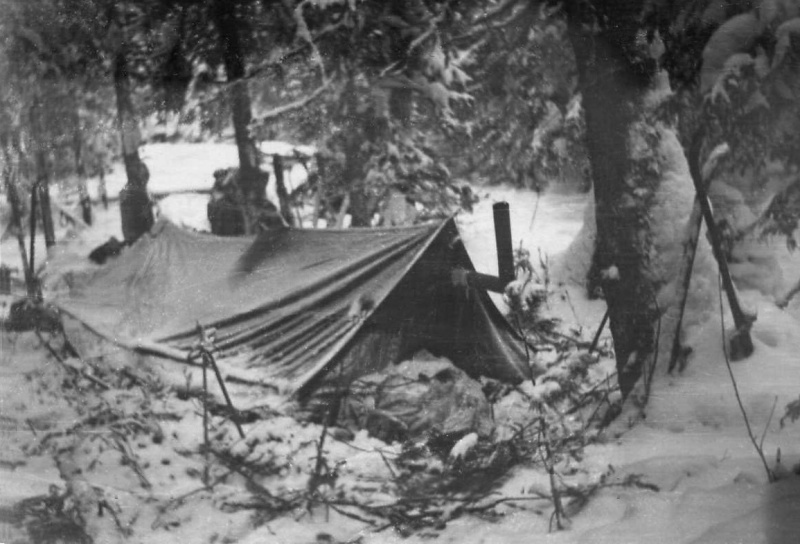 From beneath the tent they removed three pairs of skis, two of which were given to the hunters Moiseev and Mostovoy that were transporting the items and one pair was used to mark the location of Dyatlov and Kolmogorova's bodies. 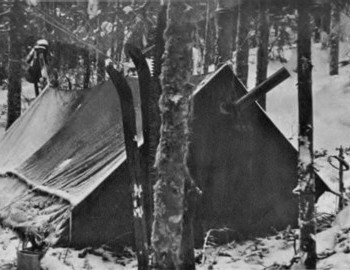 On the photos we can see captured this precise moment: the tent is completely disassembled and pushed to the side, out from under the skis of the hikers are removed, rescuers are moving down the slope. The two people standing to the left are journalist Yuri Yarovoy and the prosecutor criminologist Lev Ivanov. 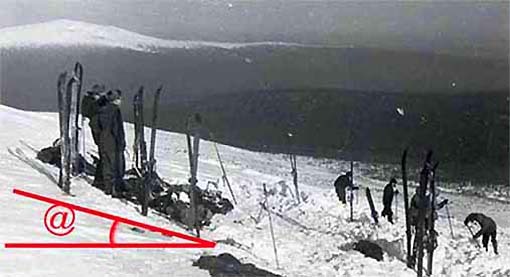 This photo is especially valuable because it allows us to measure the steepness of the slope of the mountain Kholat Syakhl right where the tent was pitched. 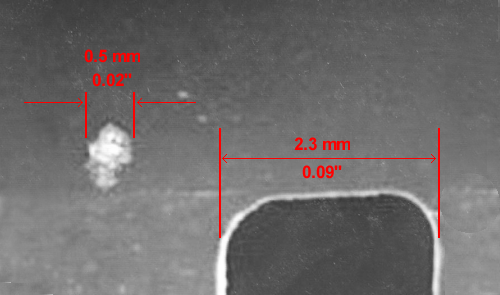 The original photograph (above) is tilted to the left, but the standing straight figures of Yarovoy and Ivanov can be used as a reference points to straighten the photo and measure the slope which is only 15 degrees. This is not more than the angle of climbing for stairs and escalators. 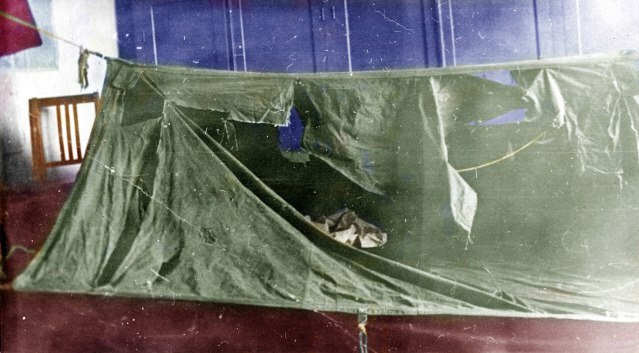 What was the mode of closing of the tent - buttons (пуговицы), straps? 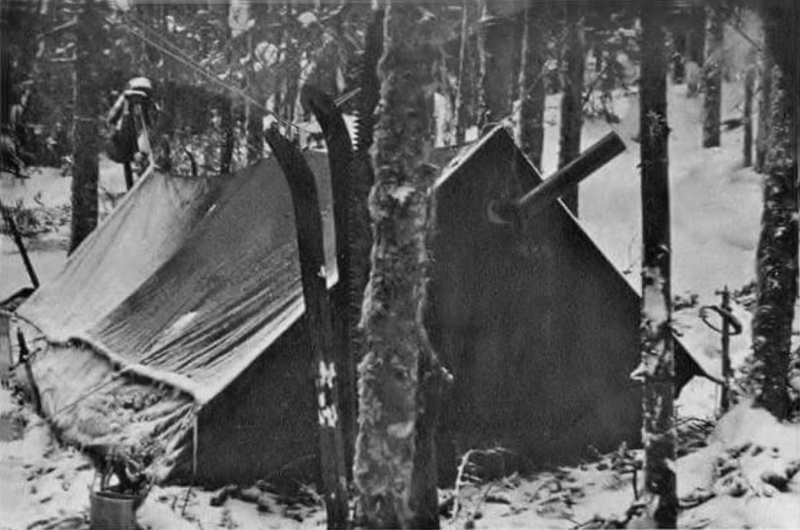 Some sources say that the tent was found fastened and only two of the lower buttons were unfastened. I can't find a document that says so. Found an interview with Slobtsov from 6 May 2015 which doesn't make it any clearer. Case file says "From the left end of the tent there is a hole that serves as an entrance. This hole is formed by two non-sewn halves of the fabric and from the inside is creped with a white sheet." ("С левого торца палатки имеется отверстие, служащее дверью. Указаное отверстие образовано двумя не сшитыми половинками ткани и с внутренней стороны задрепировано белой простынью." Nothing more on the closing and how it was found, fastened (with what?) or not. ~ If Zolotaryov and Tibo went out to pee, saw something in the sky, Zolotaryov went back for his camera and called the rest to see the light show in the sky, that is why they were with no shoes and Tibo and Zolotrayov were wearing valenki. But if the tent was fastened, I don't see the perpetrators going in and bother to fasten the tent unless they spend time inside and didn't want to be cold, which is far fetched. 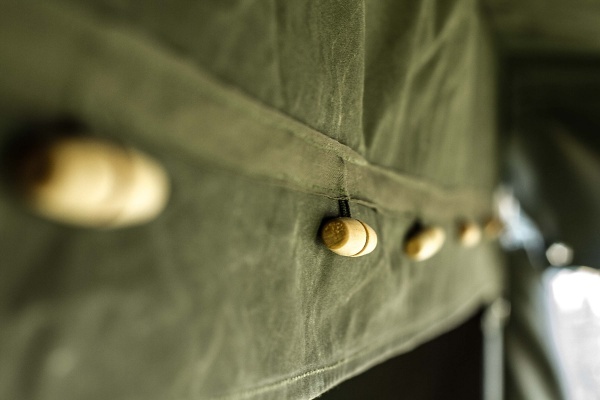 The only reliable fact is that the tent had buttons, but special ones - wooden toggles (клеванты). All other things - was the tent fastened or not etc. are just speculations. Was the tent cut on the other side? ~ If they allegedly cut the tent to escape there is no reason to cut it on both sides, not to this extend. 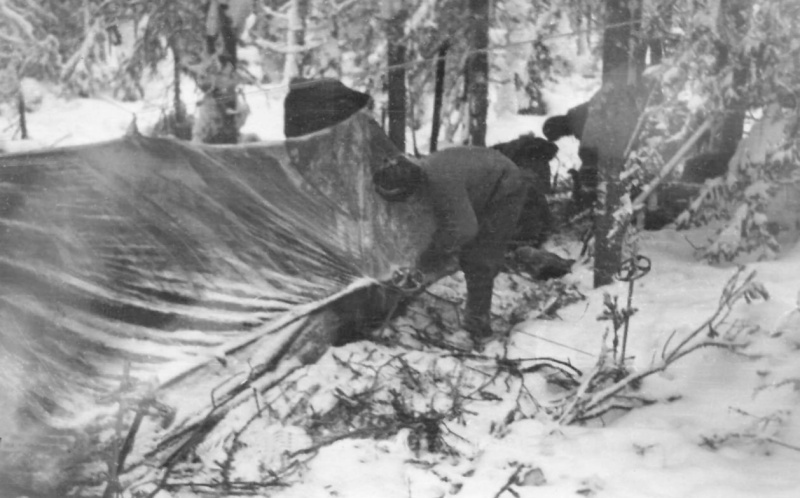 Case file says "When inspecting the tent, it is established that on its surface there are numerous damages, especially on the right slant of the canopy forming the roof /see scheme №1/." ("При осмотре данной палатки установлено, что на её поверхности имеются многочисленные повреждения , особенно на правом скосе полотна, образующего крышу /см.схему №1/.") The word especially implies that were some cuts on the other side too, just not as many. This photo is not from 1959, just visualizing my question. Was the tent tampered with? Is there any mentioning if there was something suspicious about the skis under the tent? 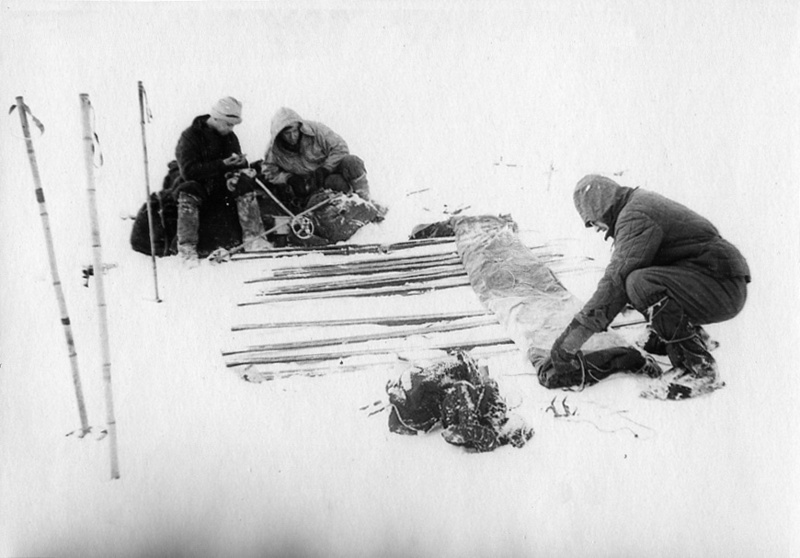 Social media postings hard to link to build theories on the "fact" that the skis under the tent were not positioned properly i.e. were the wrong side up which would testify to the doctoring of the scene. Nothing suspicious. On the contrary - testimonies from 1959 say that all was done quite professionally. What happened to the tent? Does the tent still exist? Head of Sverdlovsk Forensic Science Laboratory K. P. Kretov kept the tent. After Kretov died in the 80s the tent was taken to the garbage container, apparently water pipe burst back in the late 70s and the tent collected mold. The storage policy for evidence as well as case files is that they can be destroyed 25 years after the case is closed. Thank god the prosecutor of the Sverdlovsk region Vladislav Ivanovich Tuykov decided the case files not to be destroyed as “socially significant”, but this did not apply to evidence. Some evidence were taken by relatives and later submitted to Dyatlov Foundation established in 1999, but not the tent. 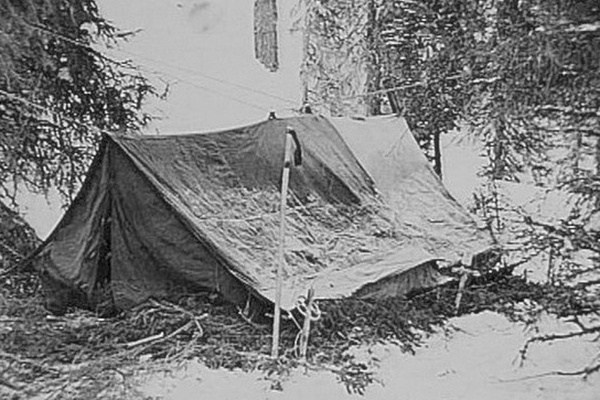 Tuykov is now passed away, lets hope the case files don't have same fate as the tent. The storage site where Dyatlov group left provisions for their way back and lighten their backpacks for the ascend. In different sources they call the site "labaz". Mansi rise platforms to store their game to pick it up later. 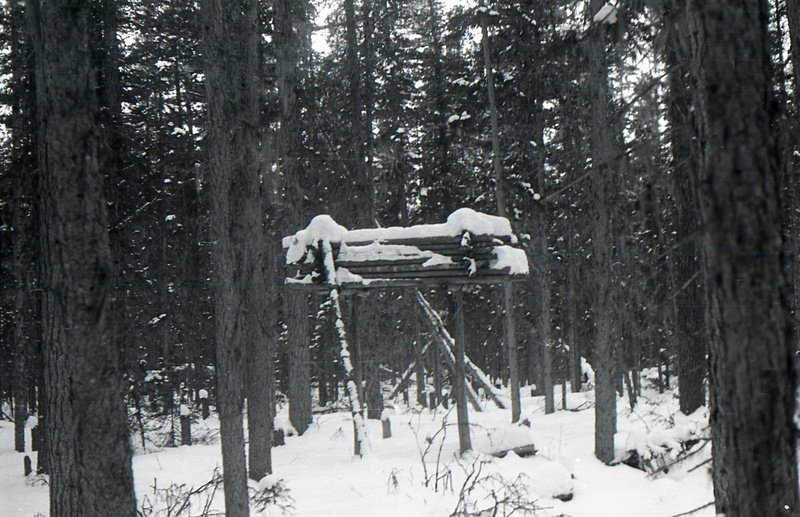 Dyatlov group labaz seems to be constructed in haste – in a snow pit, rather than in trees beyond the reach of animals, as it was more common. 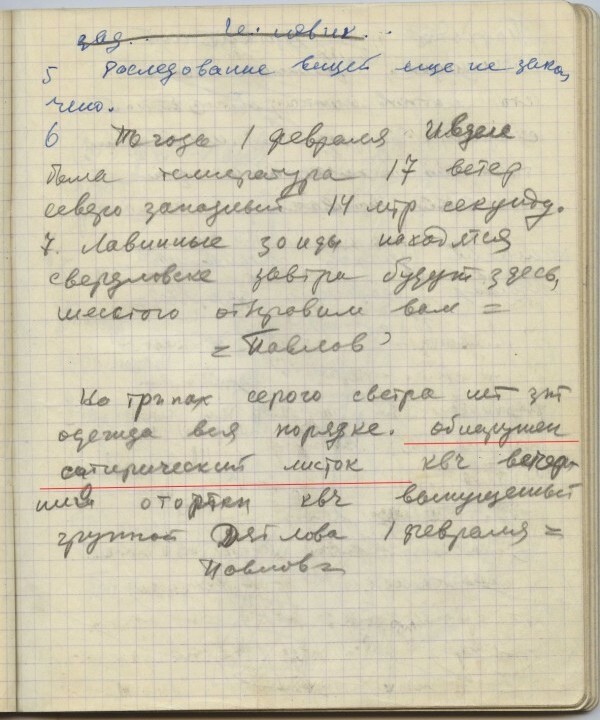 In last entry of the group diary on January 31 Dyatlov wrote "I can't even start thinking of setting up a storage" (meaning they are that tired). That can explain why the labaz was in this pitiful state. One item in particular raises questions: Dyatlov’s boots. Why continue on ski without his boots? Yudin’s answer was that, with this particular straps over the ski boots it was possible to ski in valenki and, moreover, Krivonischenko, for one, preferred to ski in his felt boots as well. Then, presuming they will be on their skis the whole time an extra ski boots will make uncomfortable extra weight. 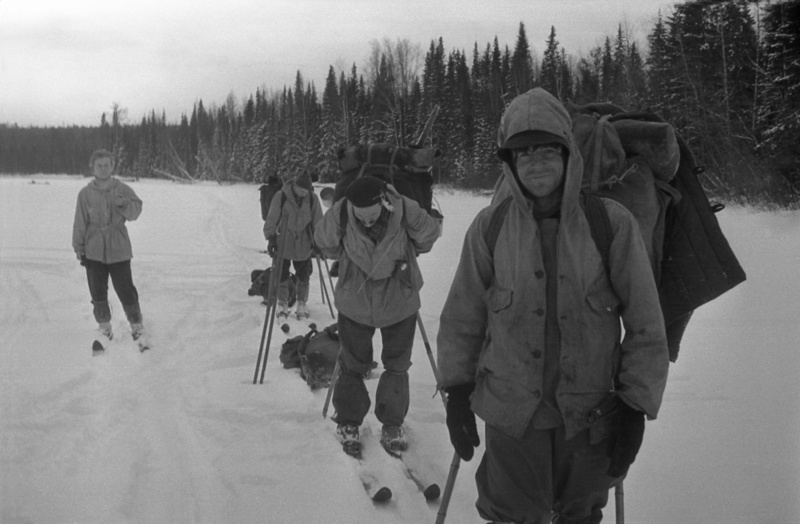 Their cache was found marked with one ski propped in the snow and a gaiter slipped onto it. Question remains who's ski is this, where is the other one, nobody mentioned anything about spare skis. Yudin returned on his skis. Did they damaged a ski and threw it away (nobody has found it), and used the spare to mark the storage? Relaying on witness testimonies is proven not to be reliable and shouldn't be final. Yudin’s memory isn’t flawless. He has been interviewed many times by different people, and sometimes he makes mistakes. For instance, in one interview he stated he searched for minerals alone at the 2nd Northern, but the diaries show that several students were involved in this. Ski professionals say that extra pairs of skis are essential for such a long route. Traditionally, the last person in the line drags them behind with a rope. It was probably this extra pair that was used to make Kolevatov's sledge mentioned in their satirical propaganda leaflet Evening Otorten. 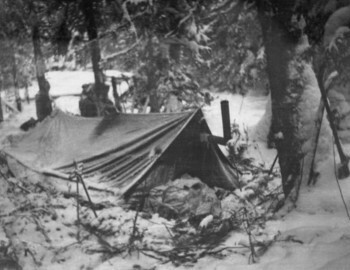 Also Slobtsov said when he first found the tent, that he saw ‘an extra pair of skis’ like this is something common for an experienced trekker in winter conditions. 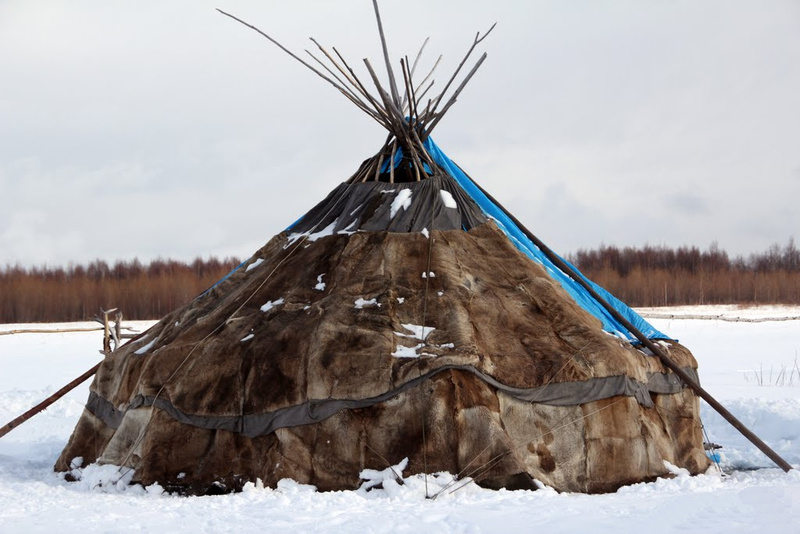 A Mansi chum (definition) was observed North-East from where Dyatlov group pitched their tent on the night of January 30. A trail leading to the chum was passing 200 feet from where they camped. 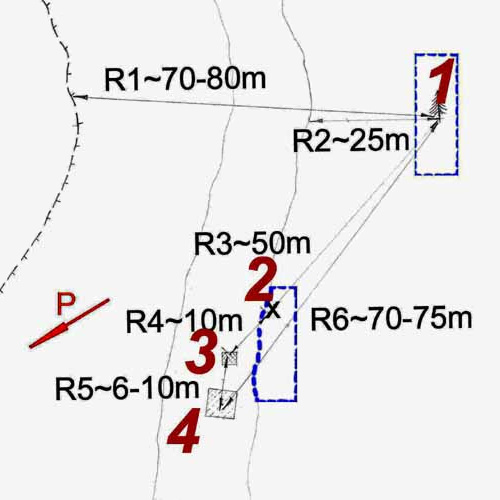 This construction is referred to as chum and was found 1 km from the tent (according to Cheglakov's testimony). About the Mansi, I know that their sacred mountain is about forty km south from the place of the deaths. Forty-five years ago there was one accident with a hunter from the Pershino settlement. He climbed that mountain and took part of the food they had left there for their gods. He brought some of it back to his home. He did this again but then disappeared and was never seen again. There were some rumors he took an arrow designed for hunting animals." "At this place a moose was killed. I can tell that it was killed and not dead because both antlers are together. When moose shed their antlers of age, they scratch on trees and usually loose them one by one. Mansi hunters left meat at that place and since the terrain is all the same around they put up a sign visible from far away. Or they might have taken the meat with them and marked the place to come and hunt again. It's just a sign. The long stick on the left is a trochee. The moose was killed in autumn. Not sure why did they leave the trochee (the long stick propped on the left side)." An ice axe was found outside the tent close to the entrance. In the criminal case file there is a list dated March 3 "Things brought from the Storage" where there is an ice axe. It is not clear whether this ice axe was the same one found by the tent or if there was another one in the labaz. No ice axe was initially reported by those who found the storage. Or, if there was indeed an ice axe in the storage this means the ice axe found by the tent does not belong to the group. On Doroshenko, Kolmogorova and Slobodin the livor mortis spots were on the top surface of the body. This allows speculations that the bodies were moved (turned over) after their death. In "Судебно-медицинское исследование тела Рустема Слободина. Незаданные вопросы и неполученные ответы..." ("Forensic examination of the body of Rustem Slobodin. Answers not received on questions not asked...") - scroll to the bottom, the author speculates that the medical examiner Vozrozhdenny mistook frostbite erythema for livor mortis. Article is citing the forensic bible at the time "Forensic medicine" 1953 by M. I. Rayski where there is no mentioning of frostbite erythema but on p. 233 it says that livor mortis in frozen cadavers change color when carried in a warm room from purple to light red, and then darken again. Same thing happens with frostbite erythema when defrosting a corpse. So the author of the article says "it is not surprising that the medical examiner Vozrozhdenny thought that he sees livor mortis spots". Map by Aleksey Rakitin - authour of the book "Dyatlov Pass"
1 - cedar, 2 - cut pants and sweaters, 3 - bodies 4 - the den. "P" the direction to the tent. Distances: R1 - the distance from the cedar to the edge of the forest, R2 - the shortest distance from the cedar to the ravine, R3 - the distance from the cedar to the cut pants and sweater, R4 - the distance from the cut pants and sweater to where the bodies were found, R5 - the distance between the bodies and the den, R6 - the distance from the den to the cedar. The blue dashed lines show the area where the fir trees where crushed to carry branches for the flooring of the den. Map by Mihail Sharavin - member of the search party that found the first bodies of Doroshenko and Krivonishenko, 2m from the cedar, the tree being between the tent and the bodies. 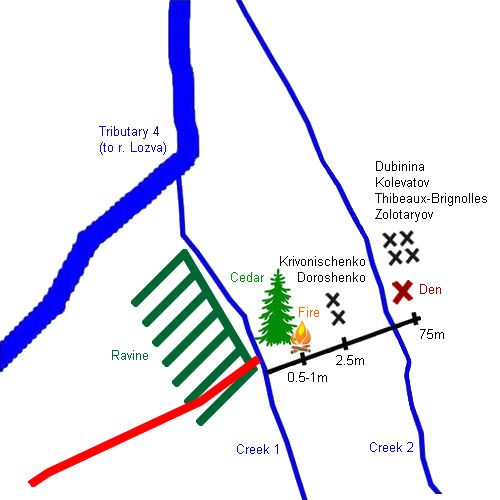 When the bodies of Dubinina, Kolevatov, Thibeaux-Brignolle and Zolotaryov were found Sharavin made a note of what he thought is the location of the bodies, a reconstruction made by NAVIG in 2009 shows den and bodies north-west from the tree and not south-east as shown in Rakitin's map. Why are these maps so important? The slop of the ravine has a 5-7 m drop to a rock bottom of creek 1 (on Sharavin's map) which could have let to a dangerous fall in the dark and caused the traumas. Back in 1959 in the former USSR it was a big deal to have a Finnish knife. It was considered a cold weapon and it required a permission from the police to carry one. Krivonischenko deliberately displayed his Finnish knife while not having a permission for it. Tibo carried a Finnish knife without permission too. Only Kolevatov had his officially, but he was not in a habit to display it publicly. All three Finnish knives were found in the tent. Tibo's and Krivo’s knives were found in their parkas and Kolevatov's Finish knife was described found in the tent, but its black plastic sheath was found later on May 6 in the area of the tent when the snow started melting down. Dyatlov's was a pocket knife and it was found in his jacket outside the tent. 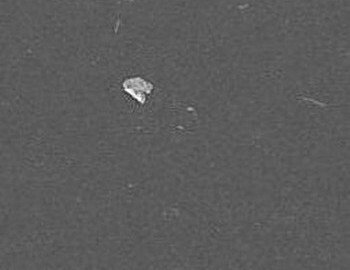 Kolevatov's knife is not mentioned in the initial lists of findings in the tent. 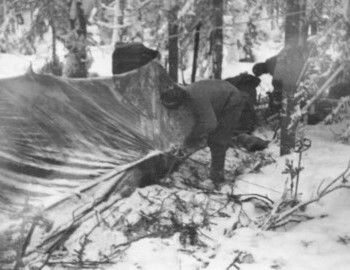 There was a knife sheath found in the ravine which was initially considered to be from Kolevatov's Finish knife. Later on Kolevatov's Finish knife in its black leather sheath was listed among the items found inside the tent. In his closing statement, Lev Ivanov mentioned Krivonischenko’s knife as a possible tool for cutting the trees and stated that it was found in the ravine next to the last four bodies. This is inconsistent not only with the Criminal Case entries mentioned above but also with "The scene inspection report" dated May 6, 1959, which goes into great detail about everything found there, including number and kinds of trees as well as clothing but never mentions any knives having been found. The document was signed by prosecutor Tempalov and several others including Askinadzi who is still alive and testified about what they had seen there. 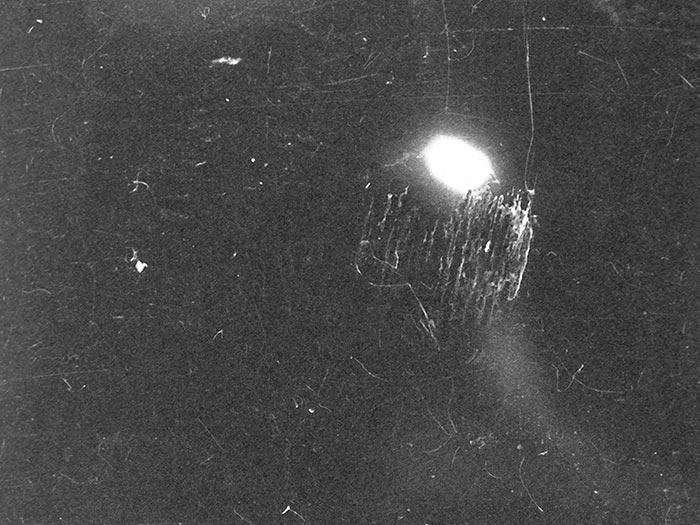 The impression is that Lev Ivanov had a commitment to close the case at any cost and so he made this evidence up in order to explain the situation with the cut tree branches. From Captain Chernyshov’s official statement: "It’s possible that other people had since been by the fire… The trees near the fire had been cut with knives, but we found no knives with the bodies." UFOs, massive alien invasion, alien sacrifice, face peering into the tent, fireballs, engine of a falling missile etc. 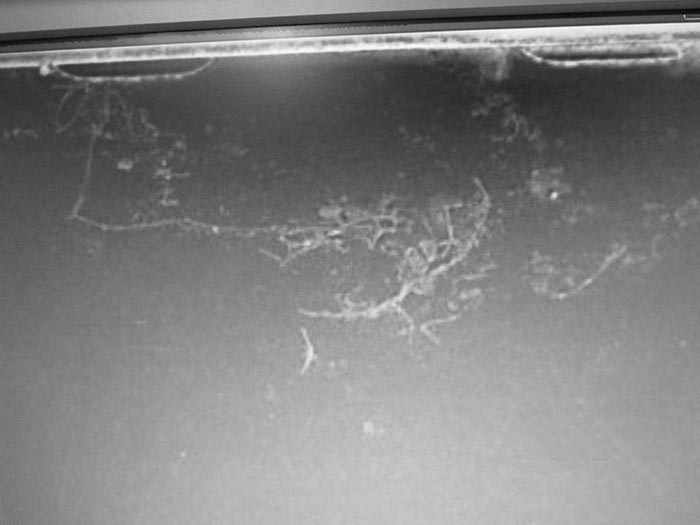 The technician in the crime lab was given a camera with a film inside which he has to develop and give back to the investigators. Old cameras have film in a cartridge, the camera makes a photo by (1) pressing the shutter and then (2) using the film advance lever to draw next blank frame from the cartridge. Some people do (2) right after (1), some do (2) right before the the shot. The technician has no way of knowing if the camera is in position (1) or (2). 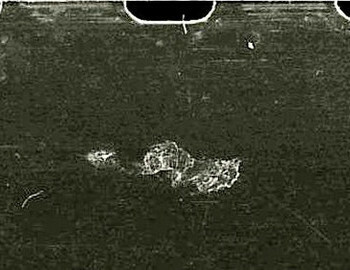 Rewinding the film is only possible in position (1). The technician can either use the film advance lever which will not work if the camera is in position (2) or press the shutter which will not work if the camera is in position (1). Pushing the lever too hard can damage the film. 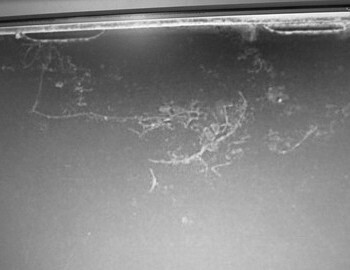 Usually the lab technicians pressed the shutter and if doesn't go off then the film can be rewinded. 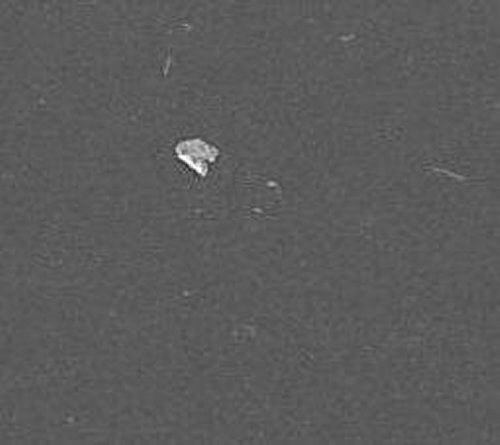 If it does go off then the film can also be rewinded but the there is one last technological photo which captures whatever is in front at that particular moment - wall, ashtray, table, papers, and a lot of unidentifiable objects nearly always out of focus. The shutter of Krivonischenko's camera was cocked, so the notorious photo №34 came to life. Initially this frame was not presented in the investigation as pаrt of the film, and it should have remained that way, because introducing it at a later time inflated even further the monstrous significance that this photo is gaining. One sentence is copied throughout the net "Some of the hikers' clothing (2 pants and sweater) were found to be highly radioactive." Vladimir Levashov, the main radiologist of Sverdlovsk, conducted the examination. Upon rinsing the clothes, it was shown that contamination could be decreased by between thirty and sixty percent. The rinse was conducted in a standard test using cold running water for three hours. Could the clothes be contaminated above the normal level by normal circumstances without having been in the presence of a radioactive-contaminated place? Were the samples examined by you contaminated? As mentioned in the conclusion, there is contamination by a radioactive substance or substances. Beta emitters were found on certain separately-sampled areas from the samples I received. 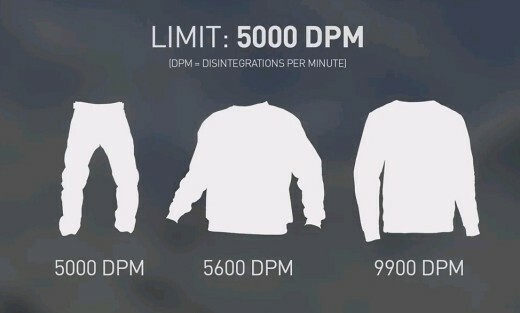 For example, the sample from Dubinina (brown sweater), at the moment of examination, had a decay rate of 9900 beta particles per minute for 150 cm2. After rinsing, it displayed 5200 decays of beta particles per minute from 150 cm2. Normally, contamination of beta particles from 150 cm2 should not exceed 5000 before rinsing. After rinsing it would be expected to find a normal level equivalent to the natural base level, which is provided by natural cosmic radiation for all people in a particular place. This is the normal rule for those who work with radioactive materials. 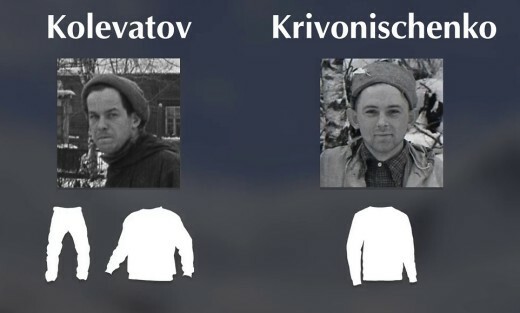 From Kolevatov, the sweater yielded a display of 5600 particles per minute before rinsing, falling to 2700 particles per minute after rinsing. In your data it’s indicated that, before they were sent to us, all of these objects had been in running water for quite some time, which means they had already been rinsed. Note: In the original document Levashov refers to Dubinina and Kolevatov as body №4 and body №1. Can we conclude that the clothes were contaminated by radioactive dust? Yes. Contaminated by radioactive dust which fell down from the atmosphere, or these clothes were contaminated while working with radioactive substances, or via contact. This particular contamination exceeds the normal level for people who work with radioactive substances. 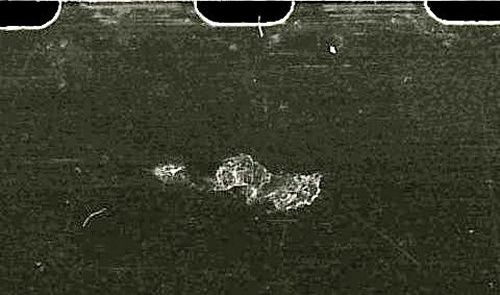 What was the real degree of contamination of some objects considering that they were in running water for about 15 days? One can guess the contamination of some parts of the clothes was many times more. But we must also consider that the clothes could have been washed with differing degrees of intensity. 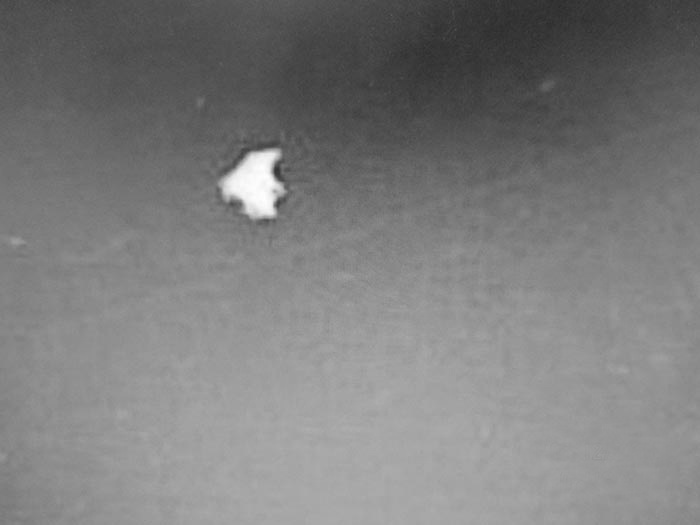 According to the book "Mountain of the Dead" by Keith McCloskey, one of the group had written on a piece of paper a day or two before the incident "Now we know snowmen exist". 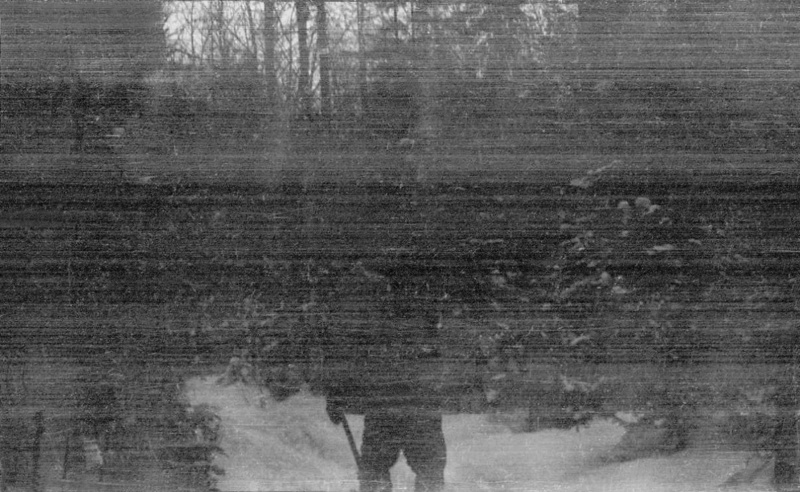 In Discovery "Russian Yeti: The killer lives" Libecki quotes a cryptic passage written in a newspaper the students brought with them “From now on we know that the snowmen exist”. In the trek “newspaper”, where they typically “reported” humorous events, was this: “From now on we know the Snowmen exist. They can be found in the Northern Urals, next to Mount Otorten”. The only written piece where snowman (or Yeti) is mentioned is in Evening Otorten №1, the satirical propaganda leaflet Dyatlov Group put together at the night of the incident. The case file does not contain a photo of this flyer, only a transcript of its content. You might think that Keith McCloskey, Libecki and others would want to consult the original document in order to independently authenticate such an apparently important clue, but they do not. Nobody knows. The original is not in the criminal case. Moreover, none of the searchers saw it in the tent. Maslennikov did not see the leaflet in the tent himself. 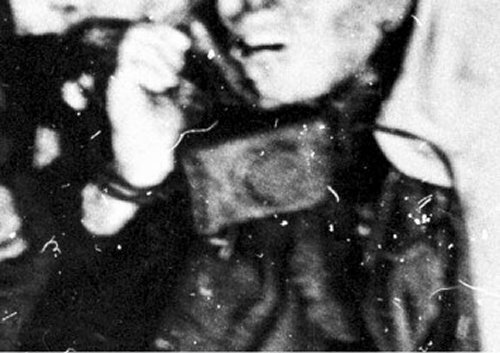 Someone radiograms from Ivdel to Maslennikov (who is on the pass leading the search operation): a propaganda leaflet was found in the group’s belongings. (underlined with red on the page from Maslennikov notebook 2) This radiogram is also not in the case files. Lev Ivanov is the lead investigator. 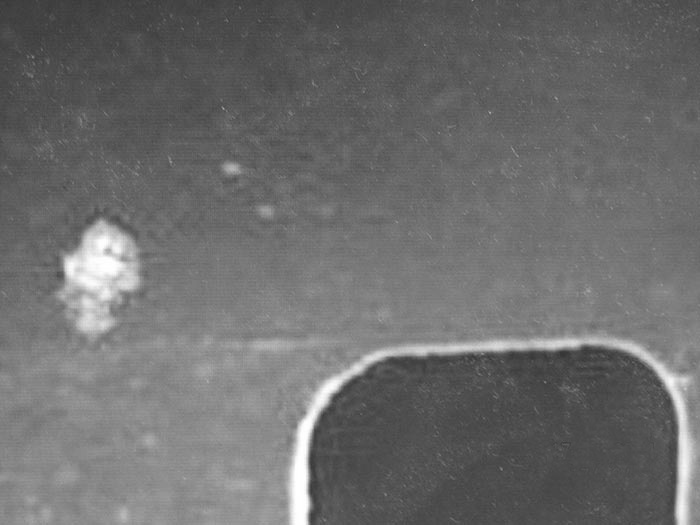 For the first time we hear about this from his article "The Mystery Of The Fireballs" L. Ivanov, "Leninskiy Put" newspaper, Kustanay, November 22 and 24, 1990 "When, in May, I and E. P. Maslennikov* examined the scene of the incident, we found that some young trees on the forest tree line have traces of burning, but they are not in concentric shape or any other system. There was no epicenter. This once again confirmed a source of heat ray or completely unknown to us energy acting selectively - the snow was not melted, the trees were not damaged. It seemed like when the hikers walked on their feet more than five hundred meters down from the mountain, someone dealt with some of them as direct targets." The date of the disaster is exactly established to have occurred on the night of February 2nd. On March 1st all the bodies are still on the pass. They will be lifted off on March 3rd. On March 1st the tent and all belongings are still on the pass, they will also be lifted off on March 3rd. The propaganda leaflet (dated February 1st) will be found among the items from the tent only on March 4th, which coincides with the fact that on the 3rd the items are lifted off, and on the 4th they are taken apart and protocoled. On the basis of what, by March 1st, it was precisely established that disaster occurred on the night of February 2nd? Yuri Yudin (the only surviving member who felt sick and turned back on January 28 from North-2) kept saying that the cameras were more than 4, nearly everybody in the group had camera. The investigation didn't seem to care. We should add that this camera became a complete surprise to Yuri Yudin. He assumed the group had only four cameras that were found in the tent. And all of a sudden a fifth camera turned out on the body. Was Semyon wearing Luda's clothes? Zolotaryov and Thibeaux were better clothed and wearing some kind of footwear (felt inner shoes). This and the fact there were traces close to the tent from urination funds the speculation that the two went out to relief themselves. It is natural to put some clothes on, although not fully clothed for a hike in the night. Zolotaryov took another camera, not the one found in the tent. Something raised his interest to take the camera with himself, and then run with it down the slope, into the den. Whatever/whoever chased the rest of the group out of the tent must not have seen Zolotaryov and Thibeaux or else they would have made them take of their extra clothes and especially the camera, since Zolotaryov could have capture a compromising shot. There are two people's footsteps joining the barefooted group a little further down the slope. The perpetrators might have not seen the two till then at all. 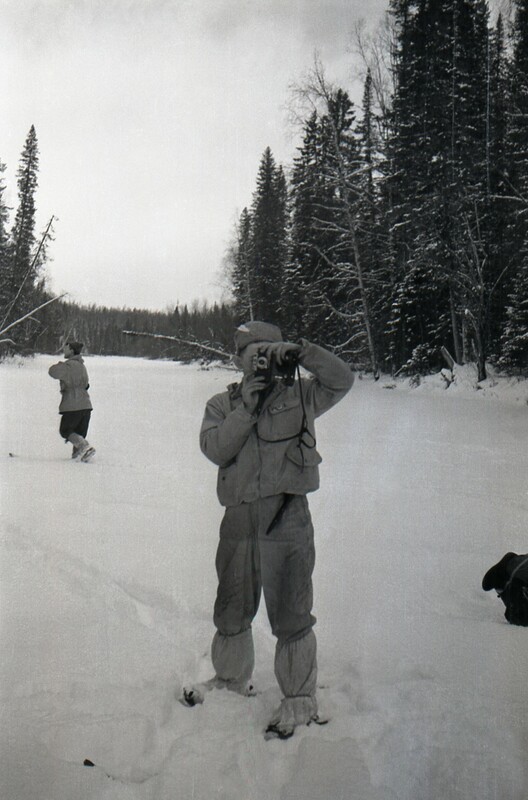 The body of Semyon Zolotaryov, shorly after being found, with what appears to be the camera or camera case, affected by water, around his neck. The camera stayed on Zolotaryov's body under the water for 3 months. 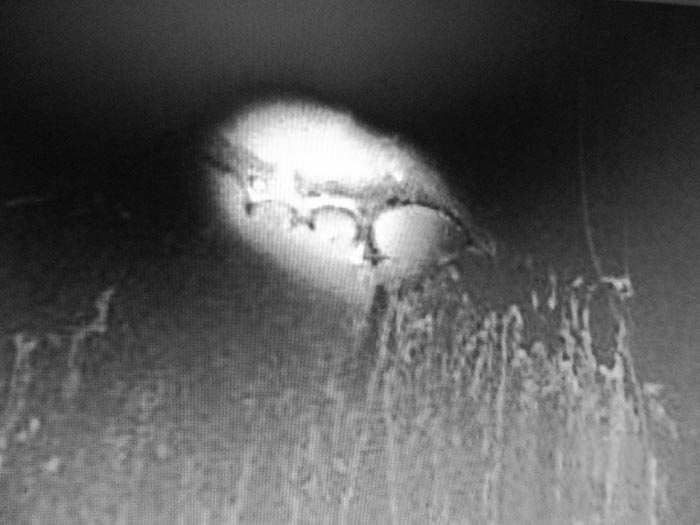 To me it is even more incomprehensible why did the attackers left the camera on Zolotaryov after the 4 hikers in the den have been beaten so severely. Zolotaryov sustained beating to the head and flail chest caused by 5 broken ribs in two fracture lines. The camera was intact. The more I know the less it make sense. 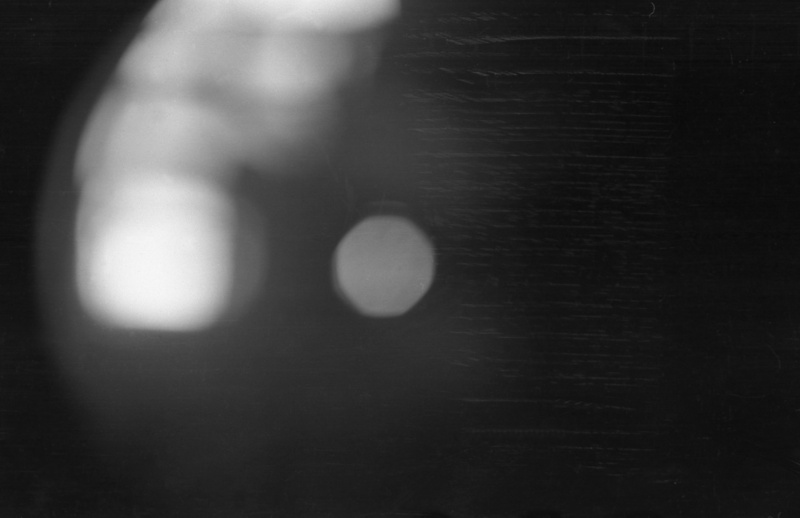 The “Zolotarev strip” of film had ten frames in it and the cut edge matched the previous strip which had 17 frames. This previous strip of 17 frames covered pictures that Zolotarev had taken in earlier days. Both strips were free from emulsion damage but there was a small section of underdeveloped film on the ten frame strip due to the layers of film getting stuck together in the developing tank. 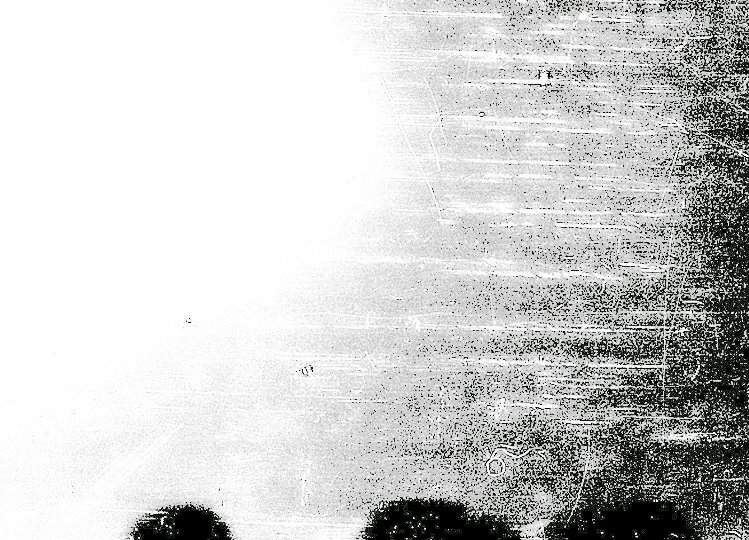 The most glaring item to begin with, in the examination of Zolotarev’s film, was that nine frames were missing. There should have been a total of 36 frames but the two strips only had a total of 27 frames. So where were the missing nine frames? Whilst the dedicated conspiracy theorist can look for any evidence that points to a cover up of some kind, it could have been that the remaining strip or strips of nine frames had been lost. This is quite possible as there seemed to have been no formal cataloging of all the items. Valentin Yakimenko felt that these missing frames contained important information and may have been “withheld” for that reason. 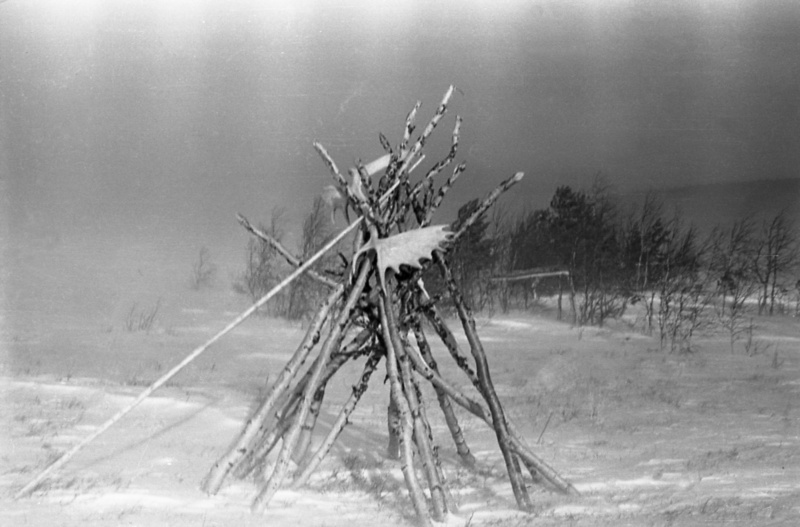 The fact that these nine frames may have contained potentially important information will shortly be demonstrated because on the face of it, Zolotarev was taking pictures outside the tent that night (1/ 2 February 1959) right up to the last moment before whatever event caused the tragedy started. First photo looks like a shot of a very large and intensely bright object above the heads of three of the group members. This I can see. The rest of the interpretations of the shots are in the realm of psychic photography. 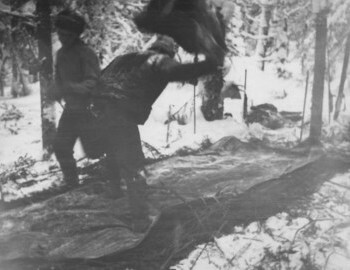 The frames are shown in the appendix of British author and researcher Keith McCloskey 2nd book "Journey to Dyatlov Pass". Valentin Yakimenko, who was a fellow student to the Dyatlov group and a member of the rescue team, presented at the Ural Federal University at the annual Dyatlov Conference 2015 examination of the films in the group cameras. 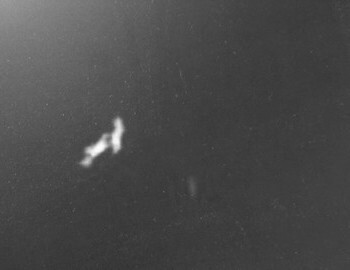 He claims Zolotaryov grabbed his camera to take a picture of some lights in the sky. 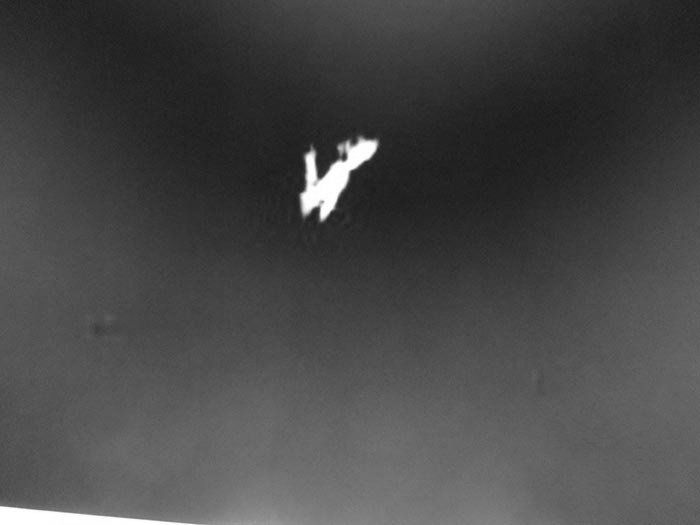 According to Yakimenko two of the negatives seem to depict a section of rocket or plane which may have broken off after a failed military experiment of possibly a two stage rocket launch. Yakimenko says that the film was scrawled with Zolotaryov's name while non of the other films was tagged or labeled. We only lately speculate about the authorship of the photos on the films, so the fact that the only camera that was found on somebody's body was good enough reason to inscribe it. I don't think that reasons to allude there was special attention to that particular film. 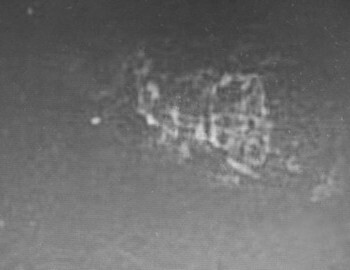 "These photographs are a clear indication, of fallen angel/higher level demonic involvement, several of which, appear to capture, a partial physical manifestation, of a higher level, shape shifting demon... Yakimenko describes some of the photos as having 'A small, but very bright object', or being 'A bright little dot', which is typical of fallen angels and/or higher level demons, manifesting in orb form, that people mistakenly refer to as aliens or UFOs." Author Cora Hull Fallen Angels Exposed. Please note that the images above, besides the first frame, are very small fragments of the actual photo. You can scale by the procket holes visible on scans 2 and 6.